Very early in my running career – way back in 2010 – I teamed up with a friend and entered the Coho Run. At 14 kilometres, it was the longest race I had ever participated in. The day dawned cloudy and miserable, and once the heavens opened – even draped in a garbage bag – I was drenched. Having had very little experience running in the rain, I kept that garbage bag on for several kilometres, until I was so hot I had to tear it off. By the end of the race, I felt bedraggled and alone – being so far behind most of the other runners – but a few stalwart supporters were there to cheer me across the finish line. Fast forward to 2016 – and Debra (thanks for the photos!) encouraged me to sign up once again for the Coho Run. And the experience couldn’t have been better! What is the Coho Run? The Coho Run is a community race organized by the Coho Society – an organization formed to support “the protection and revitalization of North Shore salmon streams and rivers”. The race takes place to coincide with the Coho Festival, held annually in West Vancouver. This point-to-point race is a great middle distance between a 10k and a half marathon, which is why I chose to tackle it 6 years ago. It’s a very unique ‘beach to bridge to beach to bridge to beach‘ race, as you’ll soon learn! We are a very spoiled bunch living in Vancouver. Hot, dry summers; rainy but warm winters; early springs. Although the wet runs can get a bit emotionally trying, we don’t suffer from the sub-zero temperatures experienced across most of Canada and much of the US. Before I started running, I had less appreciation for a lot of the natural beauty at my doorstep. Sure, I recognized that the mountains were right there, and the ocean right there – but I didn’t really value it the way I should have. Then I started running. We all have our habits – some good, some bad. Running is one of my good habits, though I do tend to fall into a bit of a pattern when it comes to my running routes. But my five favourite running routes are favourites for a reason – and here they are! Conveniently located a block from my office, the Coal Harbour Seawall allows quick access to a running route with views of Burrard Inlet and the North Shore mountains. Challenging in the summer, because it’s often packed with tourists and cruise ship visitors, the Seawall is almost empty in the winter. We generally run this route on our early morning RunVan runs on Thursday mornings. Adding a loop around Lost Lagoon takes you off the concrete onto the trails – amazing to experience nature at the edge of the city! Steps from our front door…the ocean. It’s hard to beat the fact that I can run along English Bay beach pretty much anytime. Again, in the summer, this route can get pretty congested…but it’s totally worthwhile. After some tentative exploration last year, Stanley Park has become my destination for many of these runs. I especially enjoy running up to Prospect Point – a challenging but rewarding climb – and then descending through some of the well-groomed trails. I mix the route up from time to time, and then return along the water. A popular route for our Monday night speed clinic, the False Creek loop has the advantage of a couple of bridges. If you decide you don’t want to do the full distance around Science World, you can cut it short via the Cambie Bridge. Although more of an urban run, the views of Granville Island, boats in the marina, bridges and cityscapes never tire me. True, the ‘dog-stacle course’ of Yaletown can present some leashy challenges, but nothing that can’t be overcome! Often, when running with Forerunners, we tackle the stretch of beach across from downtown Vancouver – some of the most stunning views of the city. Then we head up, up, up to the University of British Columbia. While the ‘UBC hill’ can strike fear in the heart early on a Saturday morning, the views across the ocean are a welcome distraction. Last fall, I participating in my first Fall Classic Half Marathon at UBC, and discovered a remarkable sense of peace on the roads around UBC. In 2016, I look forward to exploring more of what the ‘Shore’ has to offer – some awesome runs, to be sure! Tell us about your favourite running route! 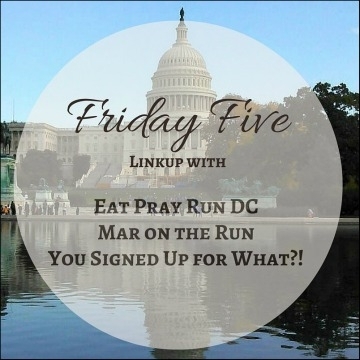 Linking up with Eat Pray Run DC, Mar on the Run, and You Signed Up for What?! for this week’s Friday Five – Favourites! This post is Part II of a two-part series outlining my experiences at the Rock ‘n’ Roll Vancouver Remix weekend! In Part I, you can read about the Cunningham Seawall 10K. I won’t touch on package pickup in this post, since I also covered it in Part I! I was still aching from the day before when I woke up considerably earlier for the half. I knew two folks starting in the early wave at 7:45am, and wanted to be there to send them off before my 8:15am start. So I headed down in order to arrive by 7am. Since the race started directly in front of my office building, I wisely brought along my passcard, and took advantage of my own VIP washroom. What could be better? I connected with Susan, who was really keyed up for her first half! Then, I had the opportunity to meet an out-of-town BibRave Pro for the first time!! Elizabeth (@trainwithbain) and I had been corresponding, so getting a real-life hug was awesome. I envy a lot of our US BibRave folks, who travel quite freely throughout the States to various races (much cheaper than domestic travel here in Canada). Ran into Corinna (@gusgreeper) and hubby Adam in my corral before our wave was launched. Now – I had set some goals for myself, after a bunch of split calculating the night before. I wanted to take it easy for the first couple of kilometres – avoid going out too fast – and then pick things up for a nice steady pace to cruise to a personal best. Maybe I went out too slow. By 5k, I realized I wasn’t quite where I wanted to be, but thought I could make up the time. As I approached 10k, it was clear that a PB was not in the cards. Somewhere around this point, I caught up with Susan and – as requested and with her explicit permission – I gave her an encouraging slap on the bottom. I like to think that gave us both an extra burst of energy! By this point, too, we had passed several bands/musical performers. A couple provided some great energy, others were a bit down-tempo. All of them were pretty good. But none of them had signs to tell us who they were, so I have no idea who I really liked. My honey was waiting (at the spot closest to home) to cheer and take photos as I went by. As we headed into Stanley Park, along the road by Lost Lagoon, and up the hill by the Rose Garden, my pace continued to flag. I was tired. We passed a singer performing Leonard Cohen’s ‘Hallelujah‘, and a guy to my right said what I was thinking: “Enough with the ballads, already!” Talented musician, to be sure, but really not the rock ‘n’ roll one needs to be inspired! Somehow I managed to pull myself out of my slump for the final 3 kilometres – which pretty closely mirrored the previous day’s route. It took everything I had to get across that finish line…and I was absolutely beat. However! I had finished both races and was able to claim my Remix medal! I felt like a rapper! I waited to see Susan finish her race, all smiles and celebration! Then cheered for Debra when she arrived. I was so knackered that I didn’t even stay around for my free beer – gave my ticket to a friend. But not before a few more photos! All in all, I’m glad I took on the challenge of the Remix weekend. Although I have done a double-headers once before (the 5 Peaks Seymour and Spirit Run on consecutive days), this one took a lot more out of me (31km vs. 14km, so natural I suppose). But I was pretty chuffed and ended up taking all of my heavy medals to work the next day to show off to everyone! Why not share the bling, right? I heard a few complaints about the gunmetal grey of the Brooks tech shirt, but I kind of like it. It contrasts nicely with the sunset-esque logo depicting the statue of Harry Jerome, an accomplished Canadian track star, an icon of the Stanley Park Seawall. The medal is fantastic – a First Nations-inspired orca design, leaping out of the water. For running both the 10K and the half, I also got the Remix Medal – square, with a spinny guitar pick in the middle. As good as it gets! From what I can tell, identical to last year. A tour of Gastown and some of East Van, Chinatown, and then hooking up with the Seawall east of Yaletown, eventually moving up to the street to Stanley Park. The toughest bit is the hill at 16km past the Stanley Park Rose Garden – before the final cruise around Brockton Point. The biggest difference compared to the 10K is that we were on the road, rather than the Seawall, for the Stanley Park portion of the course – right up until the last kilometre or so. I think this race is great because you see so much of the city – although it’s not quite as ‘scenic’ as the 10K. And with a few more bits of elevation, particularly near the end, it’s definitely more challenging. The organizers/volunteers really kept people moving at the end – whereas the day before we had hung around in the finishing chute to greet people as they arrived. And due to the geography around the finish line, it was impossible to get back to the actual finish line, so I lingered outside the fence where medals were being handed out. As with the day before, there was a beer tent – and more live music. Although I didn’t stick around for beer, I’m sure it was another good part! I’ve done it twice now. Again, it’s a solid race, and I think it would appeal greatly to folks from out of town. Not a ‘no’ for me, but not a definitive ‘yes’. Yet. We’ll see. Enough people I know running…I might do it again! It was just me and 40,000 of my closest friends. That’s the joke, right, with these massive races? I know I’ve mentioned it before, but in case you hadn’t heard, the Vancouver Sun Run is the largest 10k in Canada (and 3rd in North America). It’s massive. It can be pretty overwhelming. And it’s such a lot of fun! The Sun Run is a Vancouver institution. So much so that companies small and large register teams and usually cover entry fees for their employees (and sometime for friends and families – or, as I like to call them, ‘ringers’). I’ve never had to pay to enter the Sun Run! The Corporate Team Challenge pits companies in the same industry against one another. If company teams have ten or more registrants, the average speed of the top ten runners decides the winner. One of my April goals was to be in our company’s top ten. I’ve been training fairly consistently in preparation for upcoming half marathons. The preparation for the Sun Run was part of that. However, I don’t consistently hardly ever do speed work. It’s not that I don’t recognize its value. It’s just that I’m not as motivated as I should be. Long slow runs? No problem! Quick lunchtime runs? In the bag! But speed work is the missing link. I learned that today. I had prepped my gear the night before. The weather report called for sun – and delivered! Bright and clear with just a hint of chill in the air. Headed to the start line about an hour early, with enough time for a potty break. I was able to discard my throwaway hoodie (to be donated) well before the race began. I was in the Yellow corral – the first one behind the wheelchair and elite corrals. I wanted to get ahead of as much of the pack as possible! It was good energy – with about a dozen giant beach balls being tossed around by the crowd. Eventually, though – and after being hit in the head about 5 times – it got a little old. The kids loved it, but I wasn’t the only one who tired of it pretty quickly! I spoke briefly to a colleague and his wife (who I knew were fast runners), and saw a couple of our distinctive branded shirts in the crowd. Our company provided technical t-shirts to all runners, which was pretty awesome! About 5 minutes after the elites headed out, we were off funneled into a narrow channel to shuffle across the start line. A short, steep hill just before 5k (familiar, since it’s a block from home), followed by good old Burrard Bridge. A few twists and turns and then the final, brutal climb up the Cambie Bridge on-ramp. The last kilometre down off the bridge to cheering crowds. I passed one of my colleagues heading onto the bridge – and saw two more cross the finish line just ahead of me. Homemade, if you can’t tell! Overall, this race was a success. While not a personal best, it was a course PB – when I last ran it in 2012, my result was 57:39. As such, finishing with 47:08 was not too shabby – given it was a 10 1/2 minute improvement! And while I didn’t finish in the top 10 for the company, I managed to squeak in at 15th place. I was up against some tough competition – well done, everyone! Could it have gone better? Perhaps. Should I have trained harder (i.e. done more speed work)? Obviously. Will I tackle the Sun Run again? Absolutely! The Sun Run is an experience of epic proportions. Because I was in one of the front corrals, it wasn’t quite the ‘crush’ of people that I’ve faced in previous years. I love the spirit and energy of this event that brings Vancouver together! As part of the Corporate Team Challenge, I didn’t have to do my own bib pickup. Instead, we had a post-work event at the pub where shirts & bibs were handed out – along with the technical t-shirts kindly provided by our company. The Sun Run shirt itself is a simple cotton affair (Gildan) – I generally use them for non-running workouts at the gym. Corporate Team Challenge runners get their company brand on the back as well. No medals for this race – just too many people! Unless you place in your age category. Then you absolutely deserve it! Scenic – along English Bay, and over Burrard Bridge. Very quick downhill for the first kilometre. Three hill challenges: Hornby and Pacific (just before 5km); Burrard Bridge; Cambie Bridge. Biggest challenges: tight corners from Georgia onto Denman (around 1km) and very soon thereafter heading onto Robson – with big crowds, and a lot of variation in people’s pace, it can get pretty crowded. Good entertainment from bands/performers with live music, and a few DJs from local radio stations. I didn’t use any of them, but there were plenty of aid stations staffed by young, cheering volunteers. They provide good signage of upcoming stations, too. I think it was mostly water, rather than sports drinks. Held inside BC Place – good to either warm up or cool off, depending on the outside weather. Food included: bananas, bagels, and fruit juice (thanks to Spud.com and Oasis). Sponsors also provided samples: PowerBar, Muscle MLK, McDonald’s (coffee), Dairyland (chocolate milk), and Nature’s Path. The stadium also posts giant letters so you can meet up with your team – which is great, given that 40,000 runners is a lot to sift through to find your people! No complaints whatsoever. The Sun Run team clearly knows what they’re doing. Per everything above – top notch job. The only thing I didn’t like was the darn beach balls while we were waiting in the corral – anything flying at my head kind of stresses me out. But I’ll let that one slide. Because the Sun Run rocks! Have you ever run the Vancouver Sun Run? How was your experience? What’s the largest race you’ve even participated in? In addition to the obvious perk of having a day off work, one of my favourite things about a long weekend is that I have an extra day for a run! I don’t have to get up too early, or encourage myself at the end of a long day, or squeeze it in during my lunch break. I can just go for a run! No races this weekend, nothing extra-special planned. So I thought I’d just do a recap of what got done! I made sure my Mon-Fri alarm was off, and got up when I woke up (around 7:45am). Then I took my sweet time – had my oatmeal, enjoyed a cup of coffee, scanned Twitter while the cat lazed on my lap. And then it was time to get moving! Excited to try out my new Nikes, I slipped them on and headed out the door. On Wednesday, a few of us did a lunch run, and I led us through trails at the edge of Stanley Park. That whetted by appetite for more, so I had already selected my route. I ran English Bay to Second Beach, and then entered the park. I hadn’t done this route in months. It was dry and the trails were mostly empty. For company, I listened to a Miles Not Included podcast – not the one I was featured in, but an interview with Brandon from I Run Alaska. Inspiring story – he’s gone from “couch to ultra-marathoner” in just a few years. I really enjoyed hearing his story, and encourage you to listen – and also to visit his blog! Rawlings Trail to Prospect Point. From sea level to about 90 metres (300 feet) in under 2 km. Not the hardest climb ever, but a good workout. Prospect Point overlooks the Lion’s Gate Bridge toward West Vancouver. I took the steeper/quicker route down via Bridle Path, and retraced my steps along English Bay. Once I got home, I enjoyed a yummy green smoothie. After buying a giant tub of protein powder last week, I realized the faux vanilla taste was just too strong and I needed a different solution. I bought some single-serving packs of Vega to try out, and I like them better already. I had planned to go to Pilates, but the class was (understandably) cancelled due to the holiday. I took a nap instead. After postponing a few sessions due to scheduling challenges/health issues, I finally got to reconnect with Lisa, my awesome trainer at the YMCA. Still reeling from the aftermath of my traumatic Bodycomp scan (high fat percentage, hardly any muscle), I had emailed Lisa asking her to focus on some muscle-building exercises. And boy, did she give me some work to do. I’ve been instructed to do this workout 4 times per week. OK well, we shall see how that goes. But I’m motivated and committed to self-improvement. Lisa also complimented me on my new shoes. My sleep was restless on Saturday night because everything hurt. Especially the muscles in my back. NOTE: it was not your usual ‘lower back pain’ – it was the ‘I have never used those muscles before and now I want to die’ kind of pain. The ‘I will never go to the gym again’ kind of pain. I got up and took an Advil, and then slept for another hour. Then we went to yoga. I’m so glad I did because while I didn’t think I’d make it through, with all the focus on balancing and breathing, I briefly forgot about the pain. Stretching out some of those sore spots certainly helped. After brunch, and a beautiful walk home along English Bay, I took a nap. But the sun was beckoning, so I set my alarm and then got up for another run! I enjoyed the Friday visit to Stanley Park so much that I decided on a repeat. The biggest challenge was getting there. Once the sun is out, so are the Vancouverites. And tourists. Everyone and their dog – literally. So the ‘home to park’ route involved a lot of weaving and dodging, and I nearly got hit by a bicycle. Even the trails were busy. On Friday, I encountered almost no one. Today there were lots of cyclists, even on the steep climb up the Bridle Path. At Propect Point, there was a traffic jam getting into the parking lot, so I didn’t linger. I also decided to finally listen to my own interview on Miles Not Included. And while I generally don’t like hearing my own voice, it actually wasn’t too bad. If you missed it, you can find it here or on iTunes (Episode 9). The downhill trail was not as crowded. And that is why I enjoy long weekends! What did you do this weekend? Any exercise or races? Any advice for a runner getting started with weights and strength training? For this race report, I’m going to try something new – I’ll start by sharing my personal thoughts on the experience, and then provide a more ‘objective’ summary of the race (jump to it here). Please comment to let me know what you think of this format! I started the morning by icing my right foot. Something about my run yesterday caused my foot to tweak a bit, and stepping off it felt a bit sore. One of the good things about the Modo 8K (which also has one drawback…please read on) is that it doesn’t start until 10am. As such, I was able to sleep in until 7:30, and still have time to laze around while eating my oatmeal and chilling my woes minor pains. Fortunately, because the Stanley Park Pavilion is race central, we were able to huddle inside and stay out of the ‘cold’. It wasn’t really cold at all, just a chill in the air when one is standing about, so we waited until the last minutes to check our bags and get ourselves into the corral. The Canadian Running Series puts on really well-organized races, and the Modo 8K is no exception. Announcements were timely and clear, and everyone was ready to go when the elite runners arrived on scene. Countdown was prompt and the fun began! I always find the first kilometre of this race challenging – it loops around the building, and adrenaline-rush speed combined with a sharp turn and fairly steep downhill makes for some risky business. Plus I started out too fast, a tendency of mine in the shorter distance races. Once we reached Lost Lagoon, it’s a flat course around the Seawall, typical of many Vancouver races, and I got myself into a pretty decent rhythm. BUT! Because the race starts at 10am, tourist and runners and cyclist and dog walkers are out in full force. The Seawall is not closed for this event, so the racers are not the only ones there. And because much of the Seawall is basically a path between a rock cliff and the ocean, there’s really nowhere else to go. Fine, no problem, we can share the space. What made me laugh for a few kilometres, though, was buddy running just ahead of me. He tended to veer left, to the ‘sea edge’ of the Seawall, right into oncoming traffic. Rather than simply dodging the pedestrians, however, he kind of groan/wailed at each of them, doing a weird jazz hands sort of thing to express his annoyance. I wish I could write the sound he made…something like, “Eeearrgh…!” but more guttural – you’ll just have to imagine it, or ask me the next time we meet. Personally, while I could understand his frustration, I thought it was a bit of a waste of his energy. I hope he ultimately enjoyed the race. I already knew (from last year’s race) that the final kilometre would be a killer. We disembarked the Seawall, and started up the small but killer slope. I really tried to eke out some more speed, but it wasn’t happening. At the final stretch, with the finish line clock in sight visible as a red blur because I’m getting old and can’t see as clearly without my glasses, I did my best imitation of a ‘sprint’. The guy who crossed the line just ahead of me was waving his arms in victory, so I had to pull back slightly to avoid a black eye. Despite the risks to my person, I still made a time I am proud of and a 30-second PB! As with a lot of these local races, it was awesome to connect with folks from my Forerunners training clinic, and Twitter friends both new and old (including the ones I hadn’t met in person before). We even ran into an old college friend and her family, a wonderful blast from the past! And the foot didn’t bother me again! A consistently well-run event. This is my fourth year running this race, and I feel like it just keeps getting better. I like the fact that it’s ‘big enough’ to be really professional, but not too big to lose its local charm. Keep it up! No expo, just pickup at the local Running Room store. And although they discourage it, you can also get bibs the morning of. Suggestion for improvement: option to pick up on Friday night. I understand it comes down to volunteer availability and likely other organization factors, so this is not a major issue. The men’s shirt is baby blue, not my best colour, but I like the simplicity of the design. Very good quality technical shirt from ‘The Authentic T-Shirt Company’. I wish they had an ‘extra-small’ option, however, because the shirts fit a bit large and loose. As noted above, tight and twisty downhill for the first kilometre, and then flat along the Seawall until 7km. Then it’s a not-too-steep but consistent uphill to the finish line. I didn’t use either of them, but there were aid stations with energetic volunteers at 3.5km and 7km. Fantastic finisher medal – substantial and well-designed, with a very bright and attractive lanyard. Great addition to my bib board! Food included: water/Gatorade, juice boxes, cookies, bananas, bagels, yogurt, granola. They were also selling breakfast wraps (both turkey & veggie) for $5, with proceeds going to the Take a Hike Foundation. And if you were so inclined, there was beer available. We stayed around for the awards – they recognized the top 5 female and male winners, while age group winners could claim their medals themselves. It’s nice when they recognize all the winners, but I also appreciate it when they keep it short and sweet. There were also some great door prizes (be there to claim yours!). As mentioned, Canada Running Series does a phenomenal job (they also manage the Scotiabank Half and the Eastside 10K) – and Modo as the title sponsor for the second year did a great job with branding and involvement.